By the looks of it we might get some Iron Maiden news within the next couple of weeks. 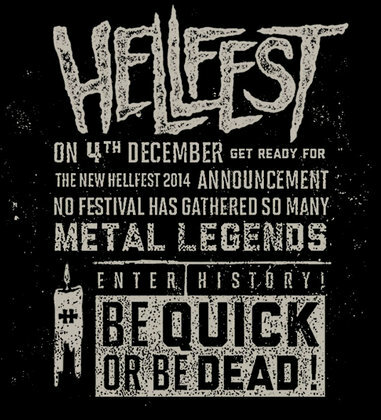 Hellfest will make their next announcement on December 4th. More and more points to a Fear of the Dark 90s era themed tour next summer. As we already know a line of licensed merchandize from that period is on sale via Hot Topic in the States. Now French festival Hellfest is teasing their next announcement with the slogan “Be Quick or Be Dead”, known to Maiden fans as the lead single from the 1992 album Fear of the Dark. Back to the old Marshall stacks and the, erm, old revolving backdrops? When asked by Vorterix.com about whether or not the band would embark on a tour focusing on 90s material the same way they’ve been touring the Live After Death and Maiden England packages, Bruce became ambiguous. Hopefully we will all know within a week or two. I’m so excited. I hope they get back over to the US for a few shows!! I’m unable to get excited. I have never longed to see a stripped down stage without pyro and a 90s-heavy setlist. Really, I just want to hear NPFTD tunes and Sign of The Cross, Futureal and The Clansman. I think this may be the only chance I ever get! They performed “Clansman” on the Brave New World Tour. A few people in the front rows gave a cheery “hooray!” but they were most likely from the crew. That show was a lot of fun and the performance of the song was glorious. Mr. Mortal Dickinson owned it, every note. I’m sure they’ll revisit. It all depends on the setlist. There’s also the fact that it’s probably impractical to load up everything for really short tours. I am ok with stripped down stages if it means more often and varied touring. But more often touring…? Maiden tour every single year as it is. More like every 2 years over here in the USA unless you consider the handful of dates this year (I already saw Maiden England twice and didn’t partake in a 12 hour trip this year). There are certain 90’s songs I wouldn’t mind seeing again and I can see that mounting some massive tour isn’t realistic. But, if they played a handful of dates in the states I would travel to see it. It’s bizarre anyway, I live in Michigan and they normally reliably play Detroit. Yet, I had to travel 6 hours to Cleveland to see Somewhere Back in Time! But seriously, what we’ve been guessing at for some time is a focus on the early 90s. And Hellfest’s “BE QUICK OR BE DEAD!” certainly seems to confirm that… And I’m just bewildered. I think a focus on the 90s, for any tour, would be a commercial mistake. So I’m afraid they’ll just plop two or three songs from the era into the set and play the same old standards all over again, like you say, Adam. Btw, it’s The X Factor that Steve loves so much! He has stated it’s one of his 3 favorite Maiden records. But I haven’t personally seen or heard him say that since back when Blaze was still in the band. Although I think the ‘Be quick or be dead’ might refer to Maiden playing at Hellfest, it does not necessarily mean they would do a tour revisiting their arguably weakest albums. What astonishes me is that you said “the usual snooze fest”. Can’t recall seeing a snooze fest involving Maiden. I had severe doubts about a ’90s setlist, BUT…. just seeing that poster and thinking about the reality of seeing them play again gets my heart pumping that bit faster… And this line-up has totally OWNED every old song they’ve played. Sooo… who cares if it’s half ’90s stuff and half the same old stuff? It’s MAIDEN, it’s LIVE and we’re on the countdown to the end now my friends, so let’s enjoy every single moment we get with the greatest band on earth! Ha ha! True… Who cares?! I never imagined, when I fell in love with this band 25 years ago, that I’d still get to see them play in 2014 AND know there’s a new album out on the distant horizon? We are LUCKY! I thought Lord of the Flies from Death On The Road album was a great version so I’d like to hear that revisited. Any Blaze era songs Bruce has never done that you’d like to hear? As I mentioned in different post, I’d like to hear Virus with Bruce. Blood on the Worlds Hands could be interesting too. Lightning Strikes Twice and 2am are two I’d like to hear with the current line-up. You might be right, but the same thing happened before the announcement of the Maiden England tour. Hot topic started to sell Seventh Son inspired merch before the tour was official. I believe the Killers design they have has been there for a while. And as Christer points out, something is bound to come of the Donington Live 1992 DVD and now Hellfest is teasing Be Quick or Be Dead. Anyway, we’ll know soon enough. Personally I hope it won’t happen. Unless they did this as a few select UK dates, I’m not really interested in festivals only. You have to sit through other bands sets your not interested in, are miles from the action, can’t see a thing, and not to mention overpriced. As for the set list idea, I’d rather they stick to FOTD era and generally avoid the Blaze albums, but I doubt they will dig too deeply either way going off the ME set, which was pretty predictable. Doing the major festivals is going to be a killer payday for them if they go with an early 90s concept. No pyro, bare bones production, downsized crew, but just the same money coming in from the promoter, all into their pockets. @Ghost: Like Torgrim, I hope it doesn’t happen. And even if it does, it’s probably more likely that they stick Be Quick and Bring Your Daughter in the set at the expense of Moonchild and Seventh Son and just play the same old standards anyway. That’s what I’m reading into it, same as you pretty much. Don’t really understand what you mean by people reading “too much” into it. What else would Maiden do, anyway? Coming off two years of touring Maiden England history. No new album in the works. A warm-up tour before writing the album playing songs from the noughties and some (few) from the early 90s could be an option. Anyway, I think we would probably get a GMETID style short tour. In my humble opinion, adding some early 90s song to a greatest hit setlists hardly qualifies as the comprehensive 90s tour some people are taking for granted! I’d say Maiden might do something similar to the GMETID tour or the first leg of TFF tour in 2010 (minus the new song, unless they write the album before the tour). Agreed. I still think a full-blown 90s History tour would be a very bad idea. At the same time, part of me would rather have that than another “all the standards, pluss a few rare ones” that Maiden England was. I wouldn’t expect more than a few of the current Seventh Son era songs being traded for Be Quick or Be Dead and Bring Your Daughter to the Slaughter or Tailgunner even. The Fear of the Dark tour was more or less a greatest hits tour at that point anyway. Thing is that the concept that comes with it has negative connotations. It represents an era where things fell apart and to some extent it will represent the exact same thing all over again if it proves that this is what they’re aiming for. It’s no doubt that it’s tougher for Maiden to sell tickets in 2013 than in 2008. I don’t think reminding people about the 90s will help turning things around. At this point I don’t expect Maiden to grow even further, but they could put a bit more creative effort into things than doing a rehashed Fear of the Dark tour. Still, let’s not jump to conclusions – we might in for a surprise. I’d much rather have a career spanning greatest hits tour than a 1992-package. If it turns out to be a 90s theme there, one way or another, how do you people think Bruce and Adrian will feel about going out to essentially tour an era that made them quit Maiden? Isn’t that a weird thing? I mean, fans often speculate that the band bypasses SIT so much because not everyone in the band is enthusiastic about it. OK. What about the 90s then? I’d say things are different now. I doubt Bruce and Adrian have the same burning desire to be creatively independent as they did when they were 20-odd years younger. Also, it wasn’t just the songs was it? Adrian has often made the point about the speed of performances. So, I doubt that a short tour, played at a more album-like pace, with only a few ’90s tracks included, for a quick payday, would upset any of the band too much. Plus, it would be payback for Janick for patiently playing rhythm guitar on so many songs he had nothing to do with over the last eight years! Adrian also disliked the musical direction taken with No Prayer. But anyway, I was more thinking along the lines of signals being sent to fans. To me anyway, such a focus would be an uncomfortable reminder of the worst part of Maiden history. Kind of like the golden age ending all over again. I’m pretty sure I’m not the only one to feel that way. Which is why I’m really curious to see how this pans out, and how they go about selling and talking up whatever it is that they’re going to do. Just a thought, maybe they’ll use the tour to try out material that’s already written/in the pipeline for the new album alongside some favourites/lesser played songs. Doubt it, but I thought I’d throw it out there. I’d love that! That would be awesome! Three new songs, five rare classics, and they could do whatever they wanted with the rest of the set. 🙂 But alas, that’s something Maiden would never ever do. I’d pay to see something like that. If they rehearse 10 rare songs for this tour after only mustering 3 for Maiden England, I’m gonna go into some kind of psychosis. There’s another thing about another retro tour…the band’s protest of not living on greatest hits glories. The disappointing count of rare songs in the ME set put a severe strain on this. If they do two History tours in a row and don’t pull out a significant number of rare tracks, I’m not gonna be able to defend them anymore. I think the mix of stuff they have been playing since the reunion, plus the brave setlists from 2006 and 2010 show quite clearly they are not living on greatest hits glories. More variety would be nice, but I am not going to complain much after having heard more than 70 different songs in their tours since the (wonderful) reunion. I don’t mean to discuss the period you mention. Up until and including 2010, I’m pretty much in awe. My point is that since then it’s become harder. Partially because of the lack of rare songs in 2011 (and only 5 from the new album), but particularly because of the low count of rare songs in 2012-13 that resulted from playing greatest hits over again. Another round like that in 2014 would make their claim difficult to defend. I have very little quarrel with the 1999-2010 period. Indeed, I think it’s as great in terms of setlists as the 80s, possibly better. Wonder if we’ll see Bruce’s kazoo version of ‘Alexander the Great’ again???? Footage on YouTube, boys and girls! @JR: This is indeed the strange thing about possibly shining a light on their 90s catalog. No one in the band is fond of No Prayer, and apart from a couple of the FOTD songs there is nothing to indicate the band’s love of that album either. Like I said earlier, when they bypass Somewhere In Time and even underplay Piece Of Mind, focusing on the 90s records would be pretty absurd. For me it comes back to a sense of reliving the decline, IF this turns out to be a 90s-focused tour. I don’t understand why People are so much complaining about setlists. Come on, think about any great big metal/rock bands in the world, like Metallica, Motorhead, Black Sabbath etc. and those bands are always playing the most of their alltime favorite songs/most famous tunes. Every single time! Of course there’s a couple of new songs every now and then and so, but basically, no matter what the theme is, bands are playing the same songs all over again. Why? Simply, because fans generally wants to hear those. Lemmy Kilmister (Motörhead) said once that he is very bored to play Ace of Spades over and over again, but he still will, cause he,knows that that song is quite adored. Adrian Smith has said same kind of things of The Trooper. But nowadays, Motorhead always plays songs like Overkill, Bomber and Ace of Spades, Metallica will play Enter Sandman, Master of Puppets and so on, Sabbath will perform Paranoid and Iron Man every single time and Iron Maiden WILL play The Trooper and so on to the distant future till they drop, so just get used to it and enjoy the incredible music Maiden delivers every single time. 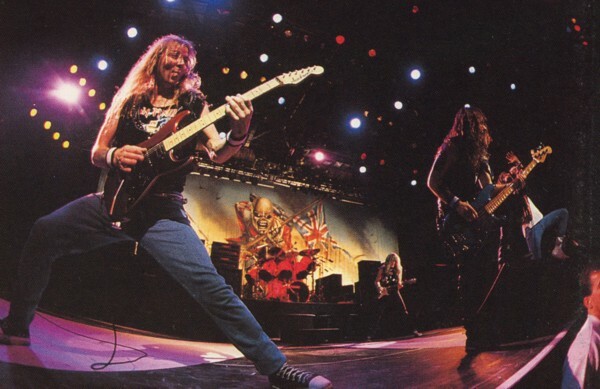 And besides, I do admit that ’90s is the most difficult time in Maiden’s history, like with many other bands, but I can’t agree with those of you that says that nothing good has come out of that era. For example Sign of the Cross has always been in top 5 Maiden song for me, especially live version from Rock in Rio, because album version has very poor mix. X Factor had a great potential, but low-quality mixing really sabotaged the album. But as a song, SOTC is one of the greatest Maiden has done. And there are other songs from that era I enjoy, but I am too lazy to pinpoint those out individually. I don’t think anyone here has stated that “nothing good” came out of the 1990s. But it would be very hard to argue that most fans DON’T think it’s the lesser Maiden decade. So it’s official. 2014 will be year three of Maiden England, but this time with a promise of setlist changes. For whatever it’s worth, Bruce tells the Sonisphere UK website that this is the last of Maiden’s History tours. Which would mean there’s no intention of highlighting the 90s in such a manner. At Maiden Revelations we’ve always felt that a 90s focus would be a huge commercial risk and therefore not likely to happen. But some fans seem to be disappointed in another round of 80s material.